Description: The Ergo-Stat ESD comfort grounder is manufactured using the highest quality performance driven materials designed for ultimate longevity and durability. Each grounder is fitted with a 1 megohm safety resistor and an 18" conductive ribbon that is tucked in between the technicians sock and shoe or placed inside the sock for intimate contact with the skin. The Ergo-Stat grounder provides stationary and mobile workers with a safe, controlled and thorough discharge to grounded esd flooring, matting or anti-static floor finish. 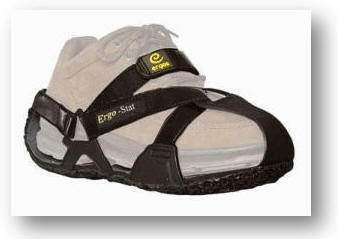 ESD protection using Ergo-stat grounders on both feet provides consistent grounding through the entire walking motion. Work Shoes, sizes in U.S.A.